This weekend I'll be a guest at the Boston Comic Con. 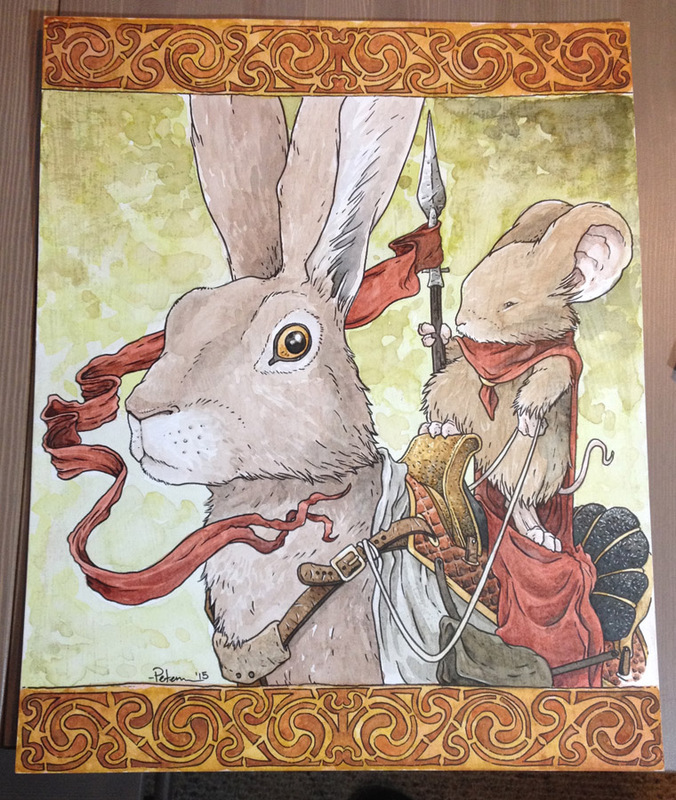 I'll be donating this new 16" x 20" Mouse Guard watercolor to their art auction. After Bob Shaw, art dealer and co-organizer of the Boston Con, saw my HEROES auction piece, he asked if I could fit something special in for their auction too. 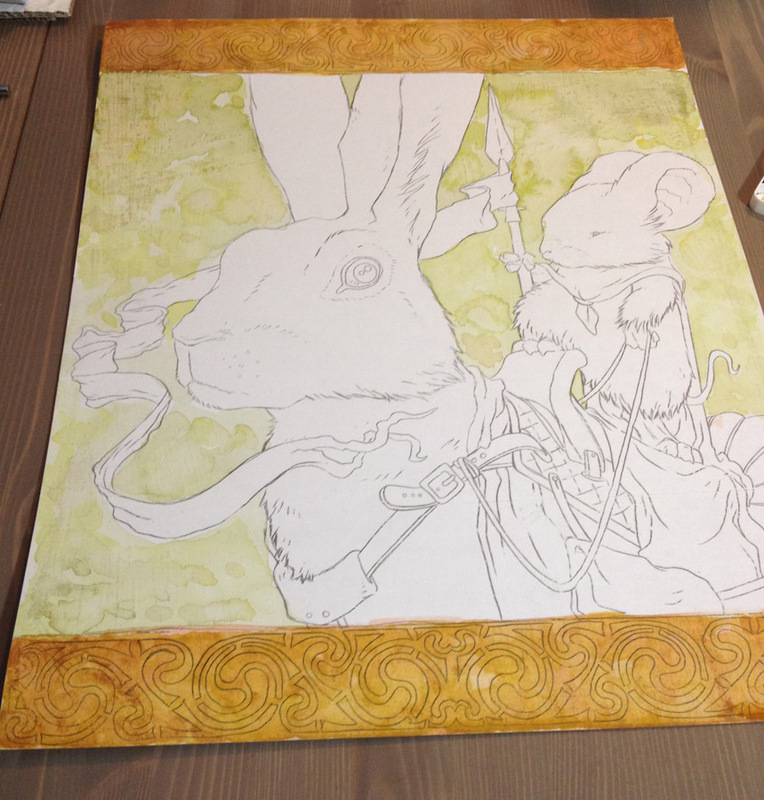 This piece follows a similar process to the HEROES piece, though on a more reasonable scale, and today's blogpost is all about sharing that process. 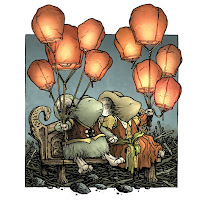 The first step was coming up with a composition. 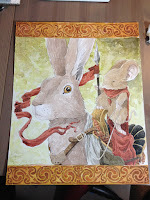 I had some 16" x 20" matboard already cut and in the studio, so that pre-determined the size of this new piece. 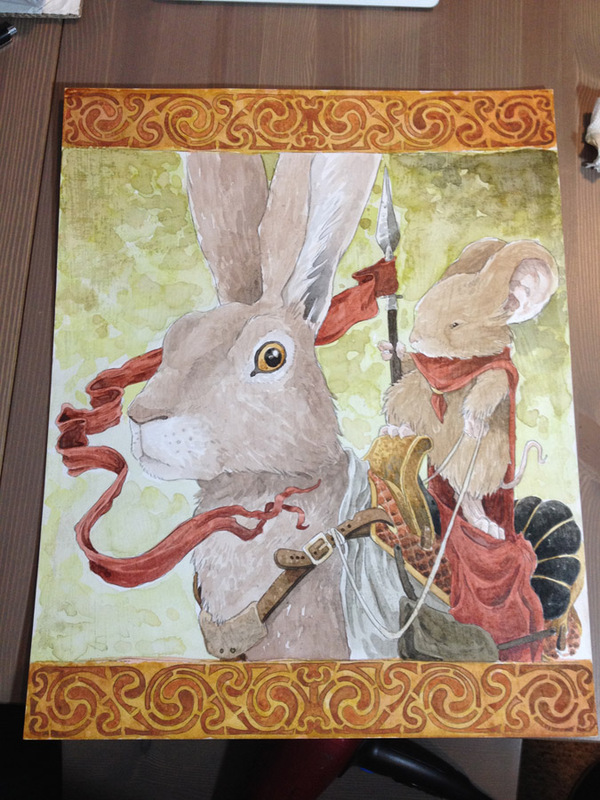 Looking through the Mouse Guard books, I flipped past the end chapters of Winter 1152 and decided to do a painting of a hare riding mouse. 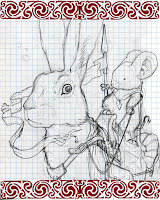 The sketch was done on copy paper, scanned in and enlarged to fit a 16" x 20" format. 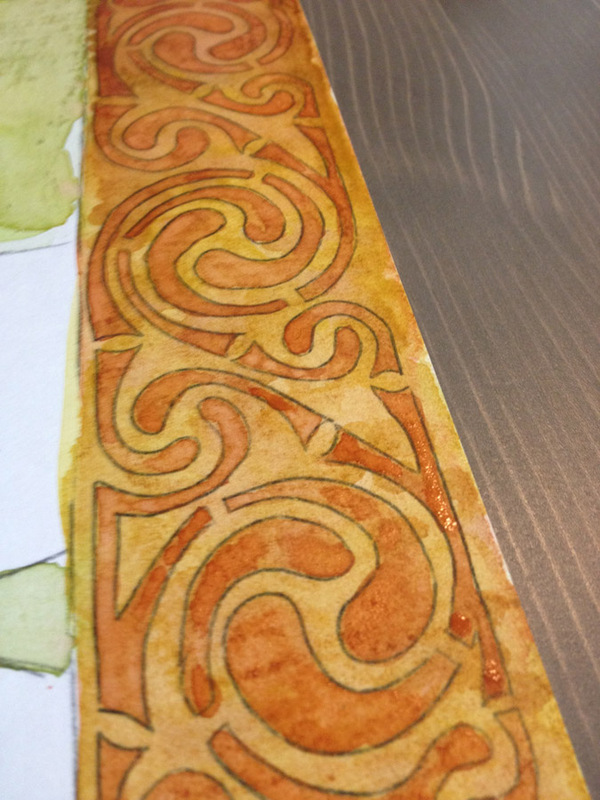 I used a border pattern I found online and then applied a grid to the file to help me with the next step. 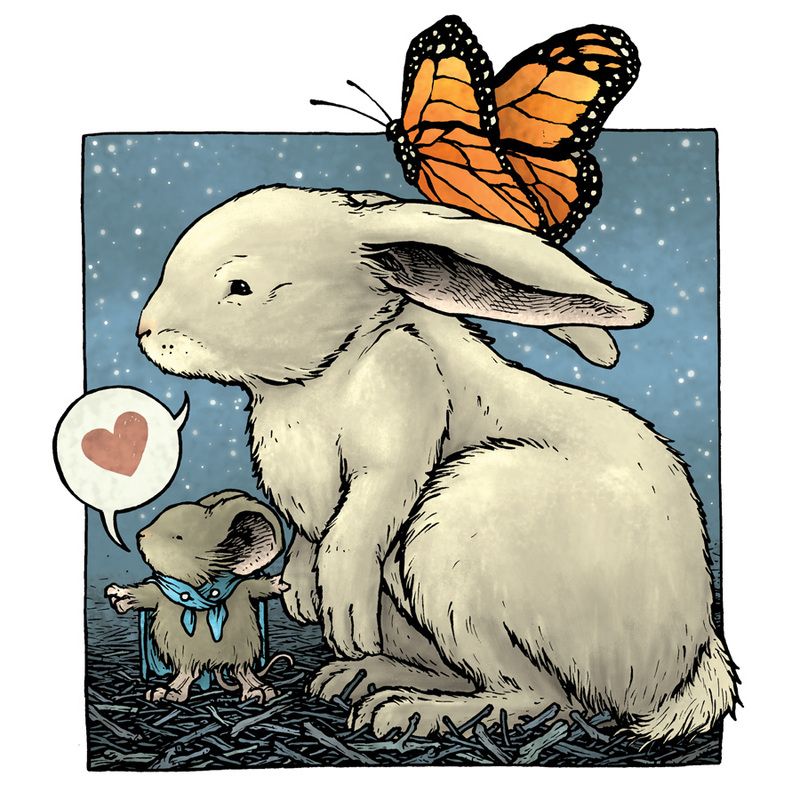 Because this piece needs to be printed at the same 16" x20" size of my matboard, I had to print the file out over the course of several sheets of 8.5" x 11" paper. 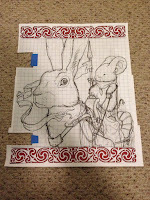 Then using the grid to help realign the pieces, I trimmed and taped together the sheets into a patchwork of the full image at actual size. I learned this method of printing large format images on standard size paper printers when I worked at the antique store Materials Unlimited and needed to make affordable new signs for sales or products that could be read at a distance. When I normally work on an image that I digitally manipulated, I then move over to the lightbox to start work on bristol with the printout taped to the back...but since this painting is on matboard, I needed to do a different kind of transfer. 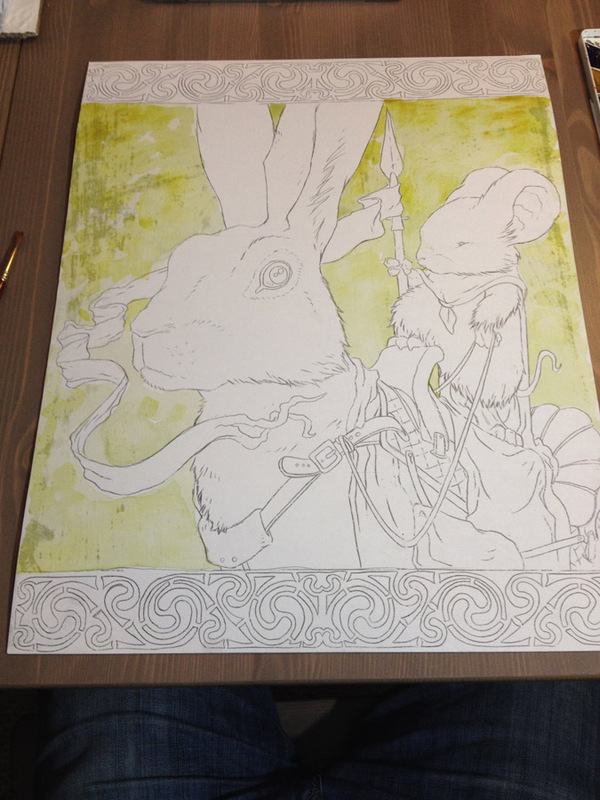 On the backside, I rubbed graphite all over the areas where lines appeared on the front of the printout. 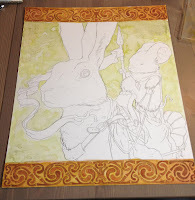 I used a light table to help me see that I was getting coverage over the lines without wasting graphite or time and coating the entire backside. 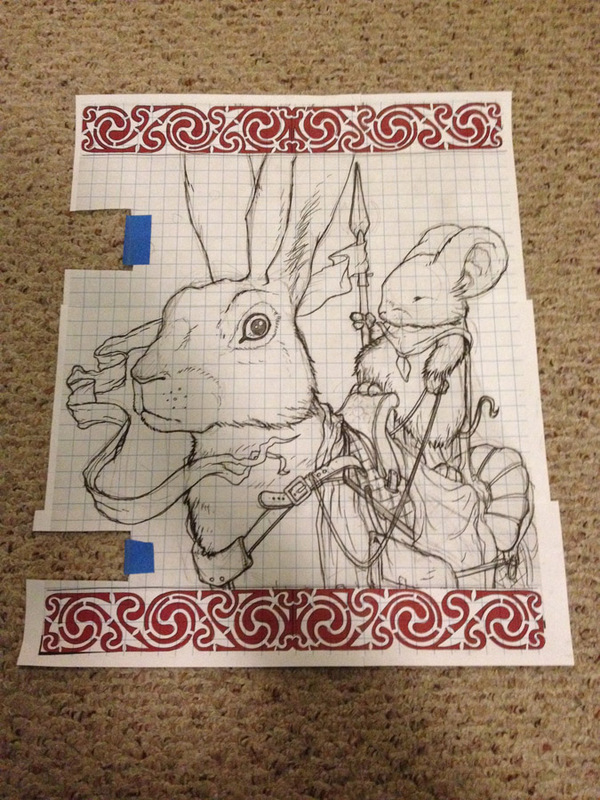 I then taped the paper printout to the front of the matboard and traced over my lines with a ballpoint pen. Wherever I applied pressure, the graphite on the back would transfer over to the surface of the matboard. 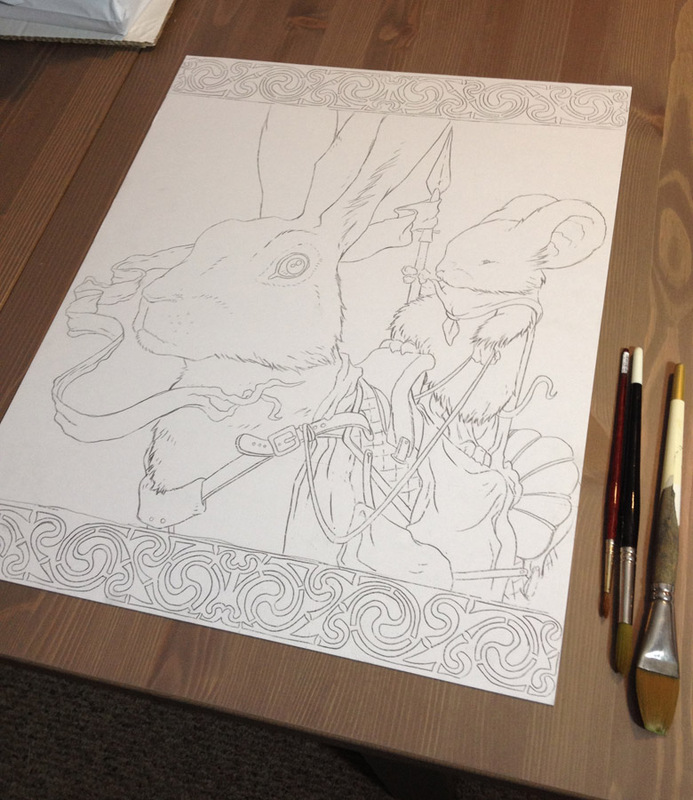 Pictured here is the 16" x 20" matboard with the entire image transferred over in graphite. 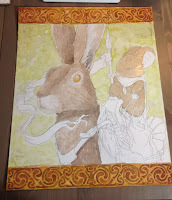 It was late when I got this step done, and I hadn't thought about color choices at all yet, so instead of pushing forward and starting to paint, I went to bed and decided to tackle painting in the morning. 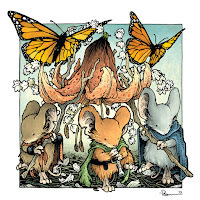 The next day, I decided that instead of the winter landscape from where fans saw the mice riding hares in Mouse Guard, I'd go for something warmer and more summer-ish. 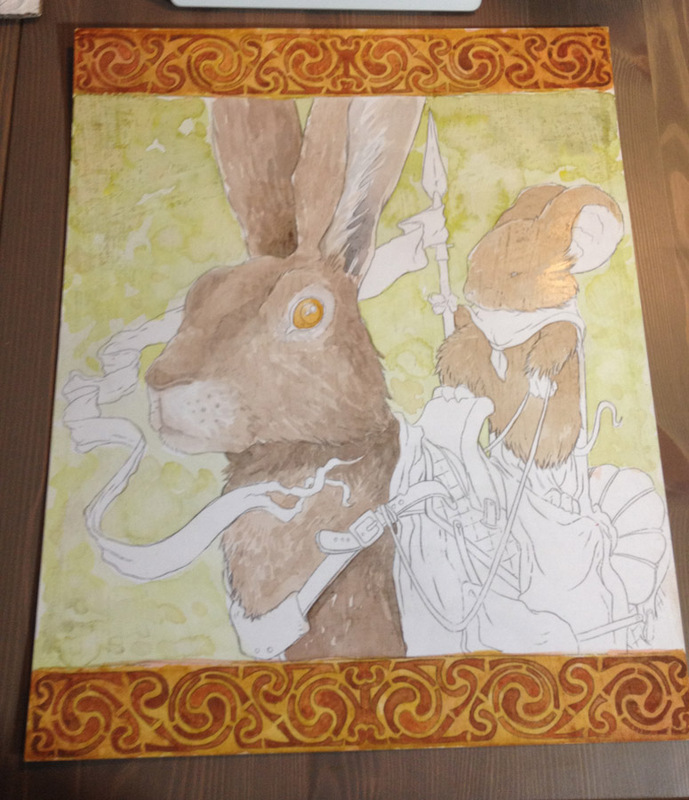 I started with a wash of yellow greens for the background. 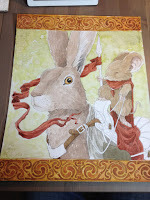 Then I discovered that this matboard, not thae same brand as the one I did my HEROES auction piece, would show the lamination glue streaks if the surface got too wet. 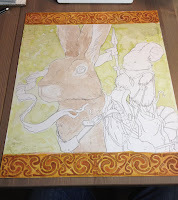 I almost stopped and considered re-doing the transfer to a new sheet of board, but that would also mean a trip to the art supply store for new board. So I thought I'd push through and if got worse I'd stop. Some more of those marks did show up, but in a way I found to be more like added texture rather than a flaw or distraction. 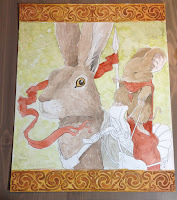 So below you will see the many phone photos I took as I worked on this piece slowly building up the watercolor and then adding link work to punch up the illustration in the end. 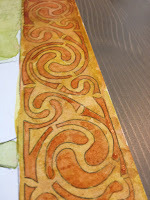 Base color wash to the border. 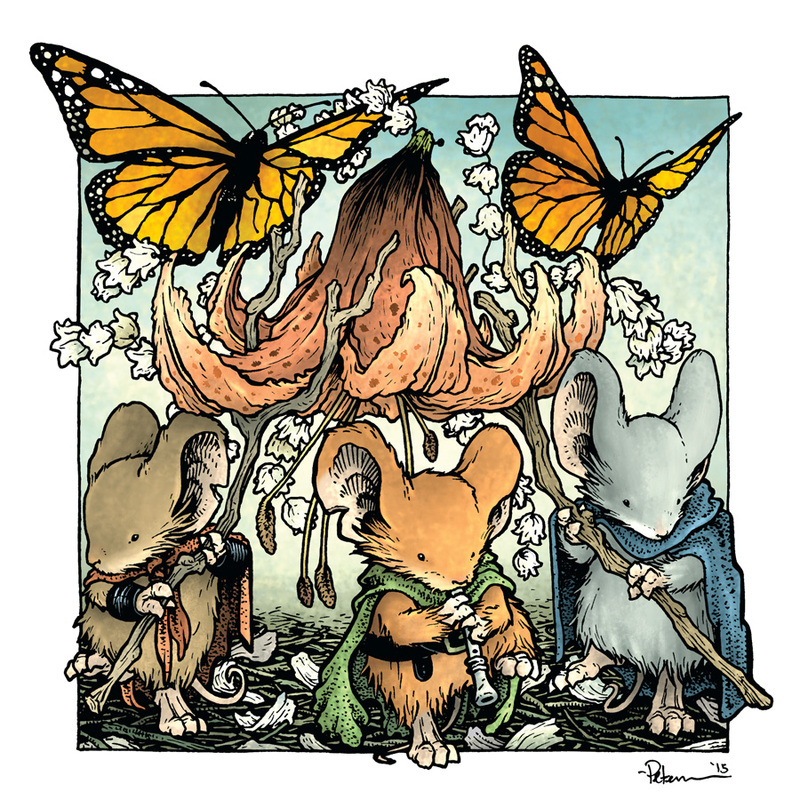 & a wash to the Mouse's fur. 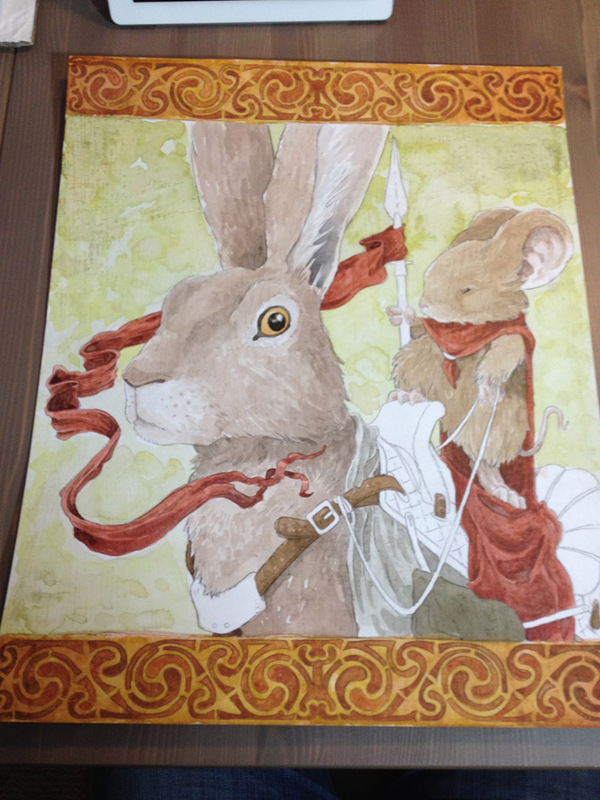 Starting on the Hare's riding tack. 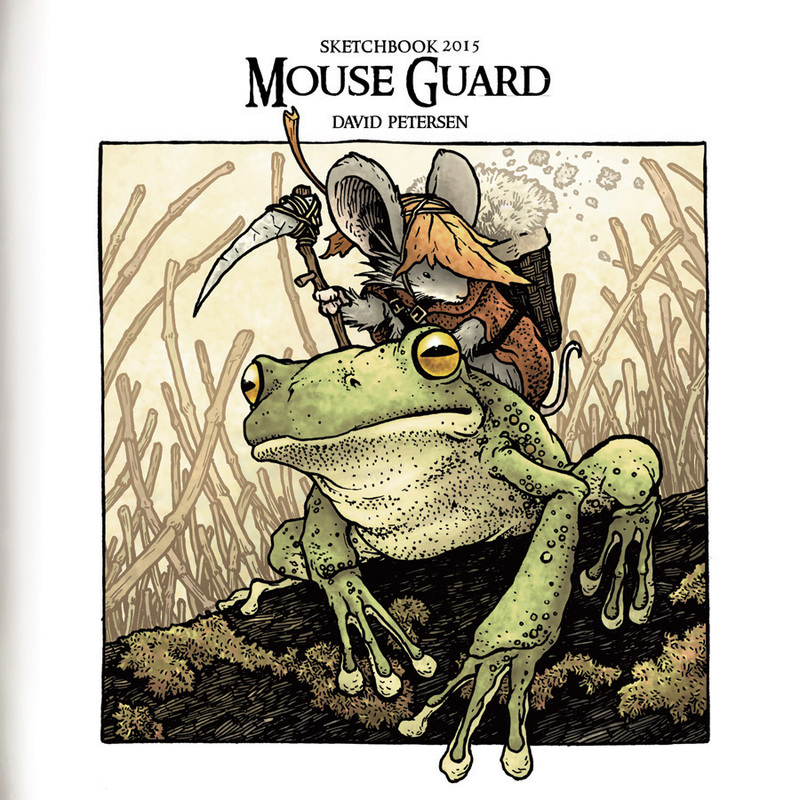 This will be available to bid on at the Boston Comic Con on Saturday. 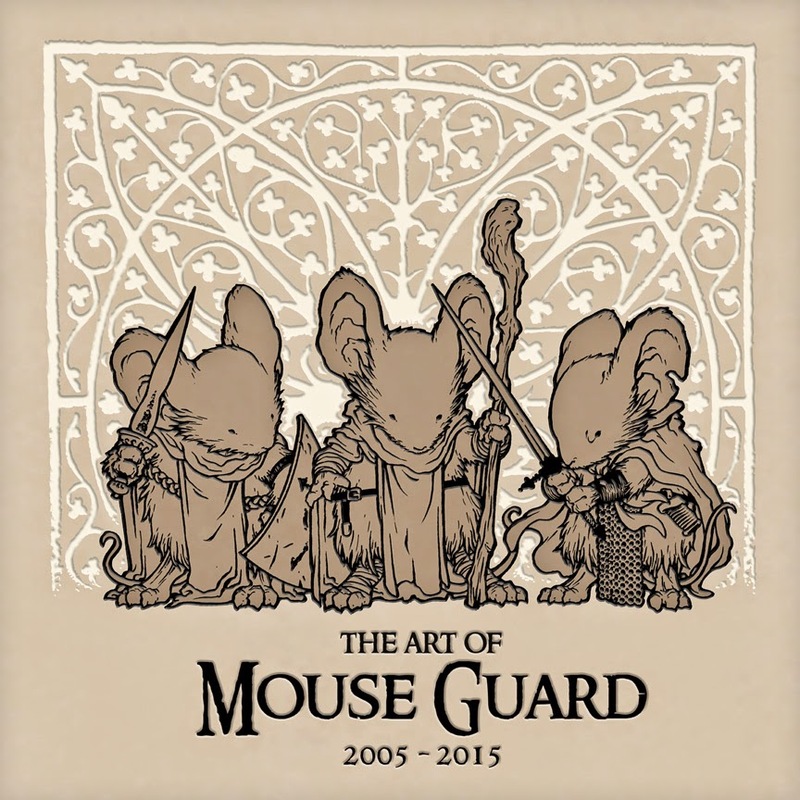 This Month a Art of Mouse Guard 2005-2015 book will be released. 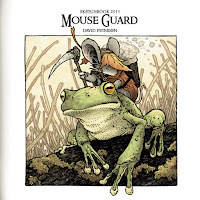 It is a 368 page 12" x 12" book full of images and descriptions of how Mouse Guard came to be, the process to create my books, and the evolution of that process changing in the 10 years I've been drawing Mouse Guard books. 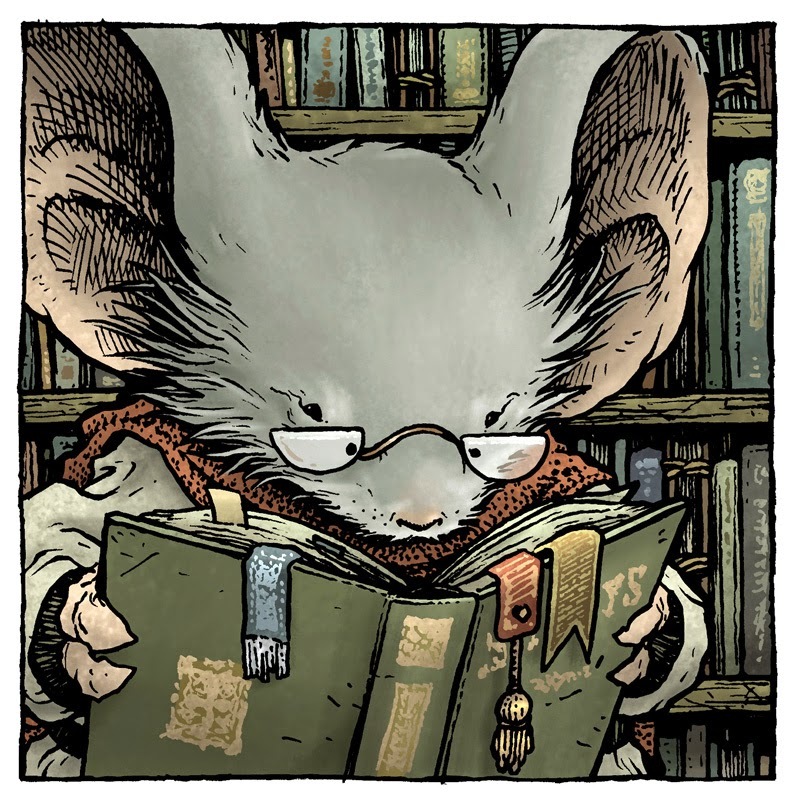 It's a book I'm really proud of. You can read a previous blogpost about it's contents here, but today I'm going to be going over the process of creating the artwork for the cover. 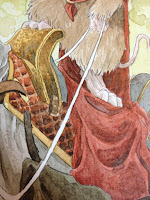 I wanted the artwork to not be a reused piece from the past, but I didn't quite manage to fulfill that desire of mine. 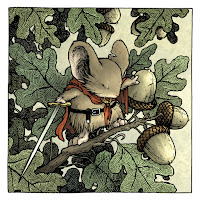 While thinking of an image that would work to summarize the contents of the book (art book, process, Mouse Guard, etc.) 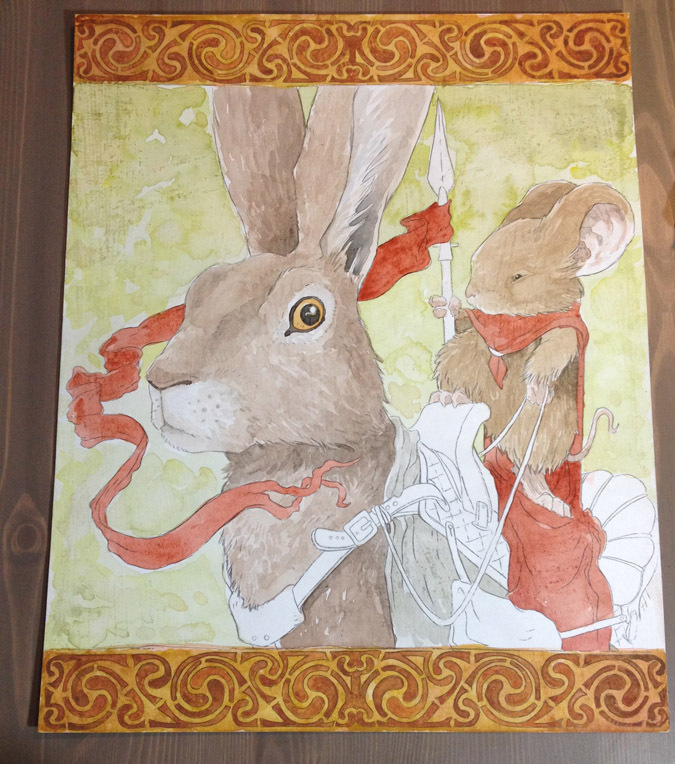 I kept coming back to the Saxon, Kenzie, Rand portion of my Weasel War teaser print from SDCC a few years back. 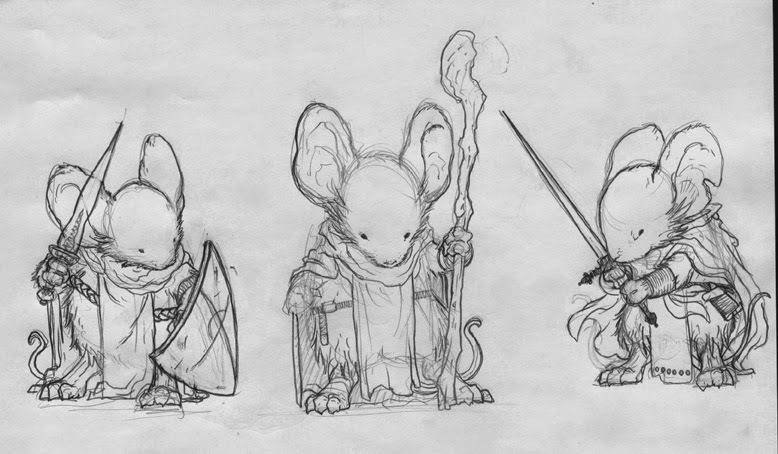 I redrew them making modifications to each character (taking away Kenzie's uncharacteristic sword for example). 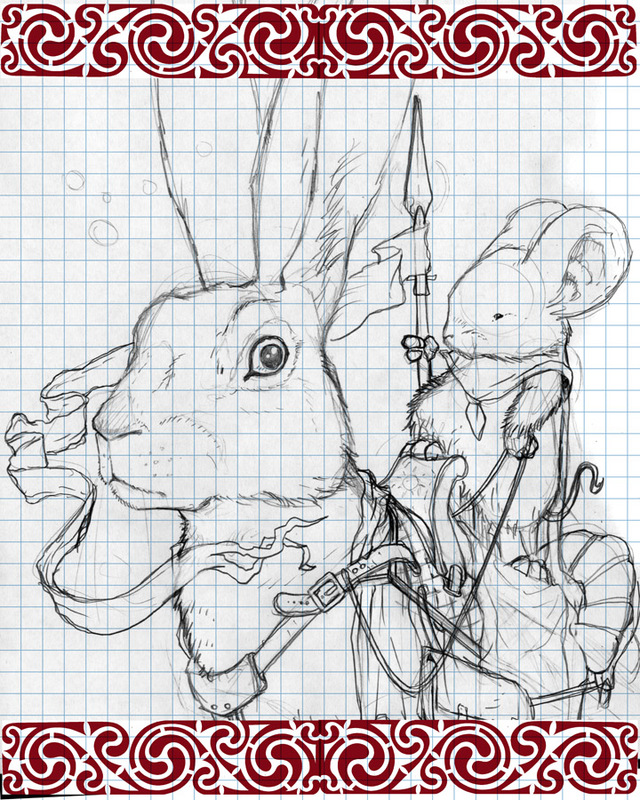 To fill the background, the editors and I wanted something design-ey. 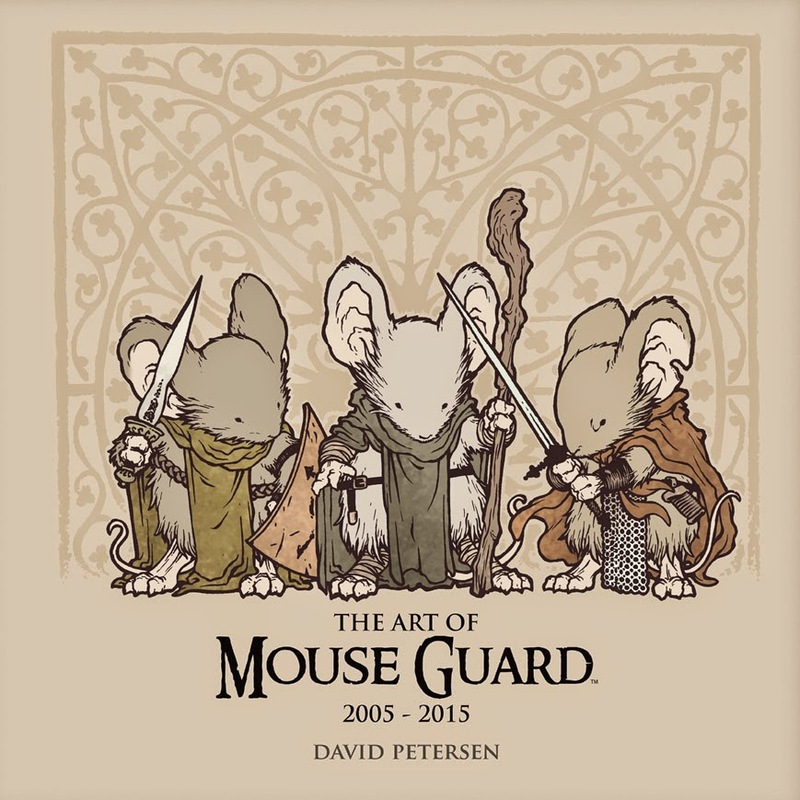 Something we could use a printing process like debossing or spot varnish on to really make the cover look classy and special. 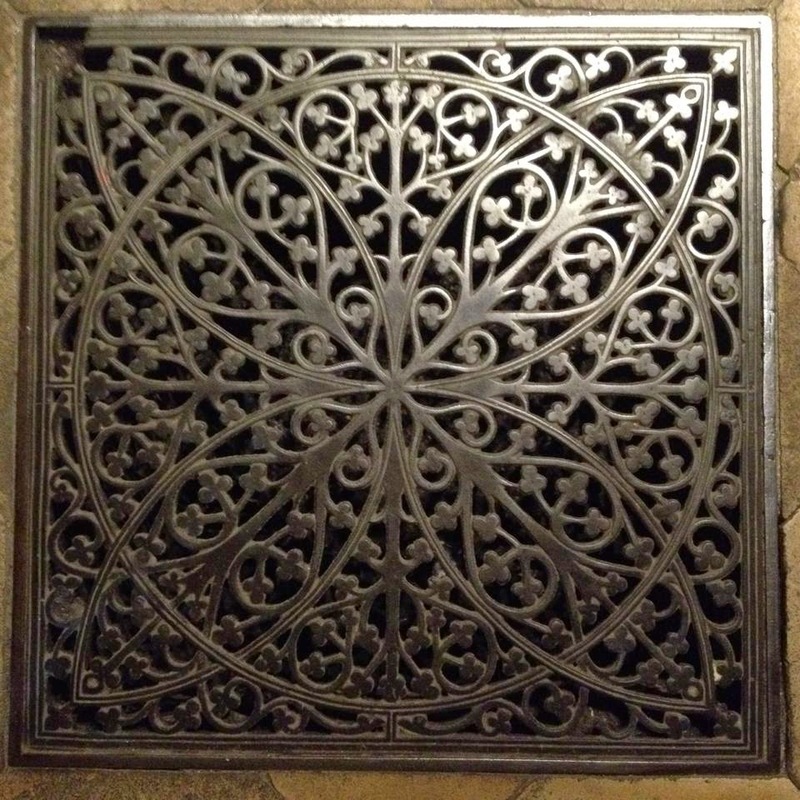 I dug through photo reference I'd taken and ran across this photo of a floor grate at Notre Dame and thought it would be perfect as it was A) already square, and B) the right density of pattern for a printing effect. 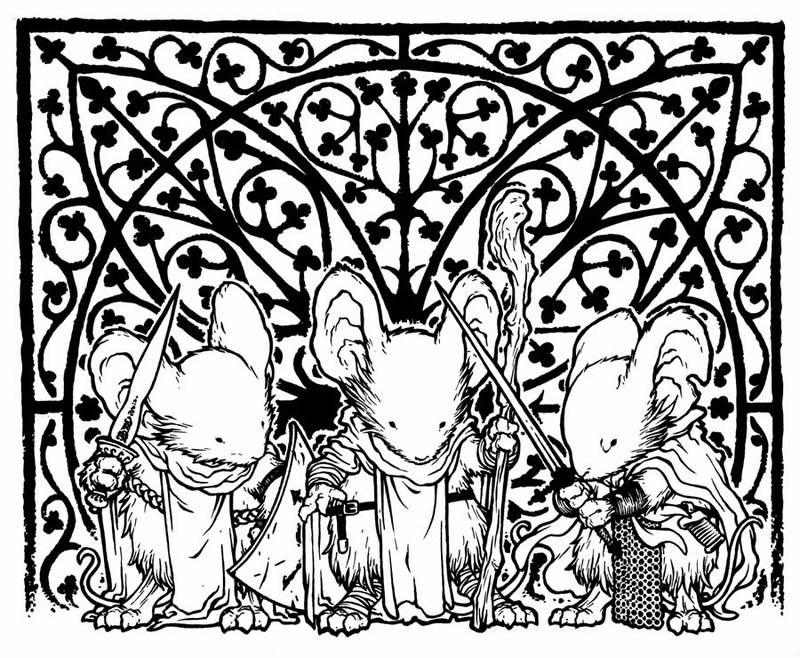 I photoshopped the pencils of the mouse characters as well as the Notre Dame grate together and printed that composite out on standard printer paper. 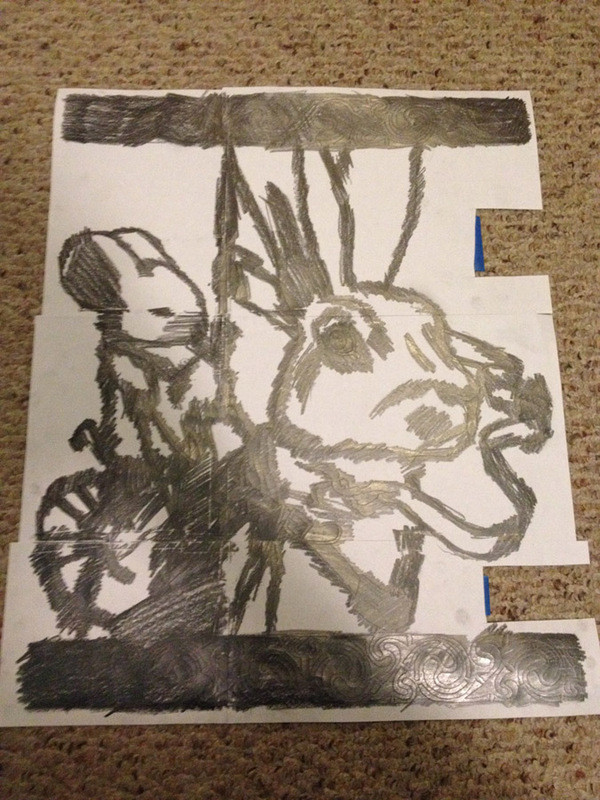 The printout was then taped to the back of a sheet of Strathmore 300 series bristol. 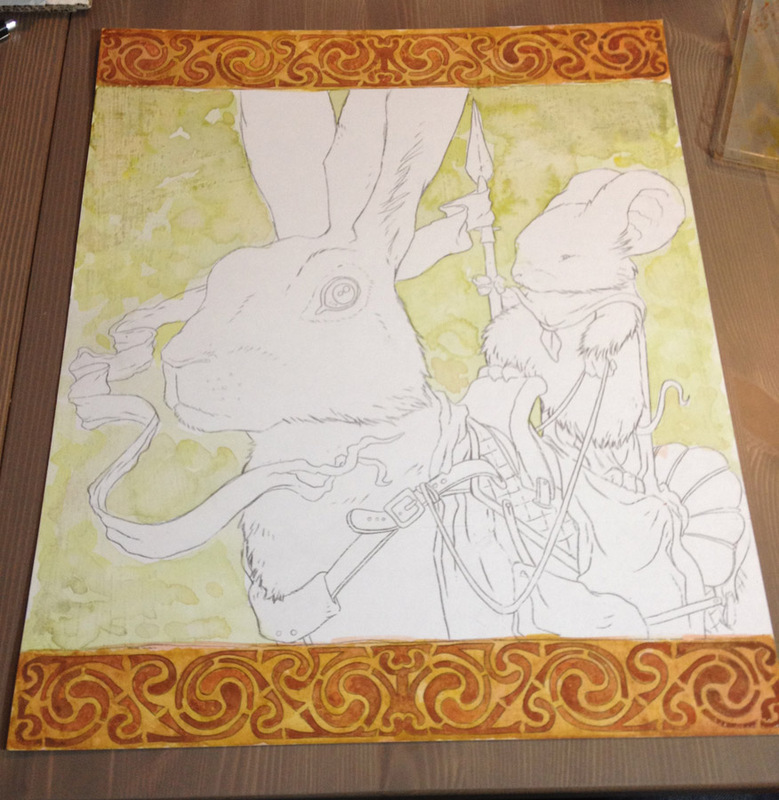 On my lightbox I could see through the surface of the bristol to the printout below and used it as a guide while I inked the piece on the surface of the bristol. This process doesn't require erasing when the piece is inked because no pencil ever touches the bristol surface. 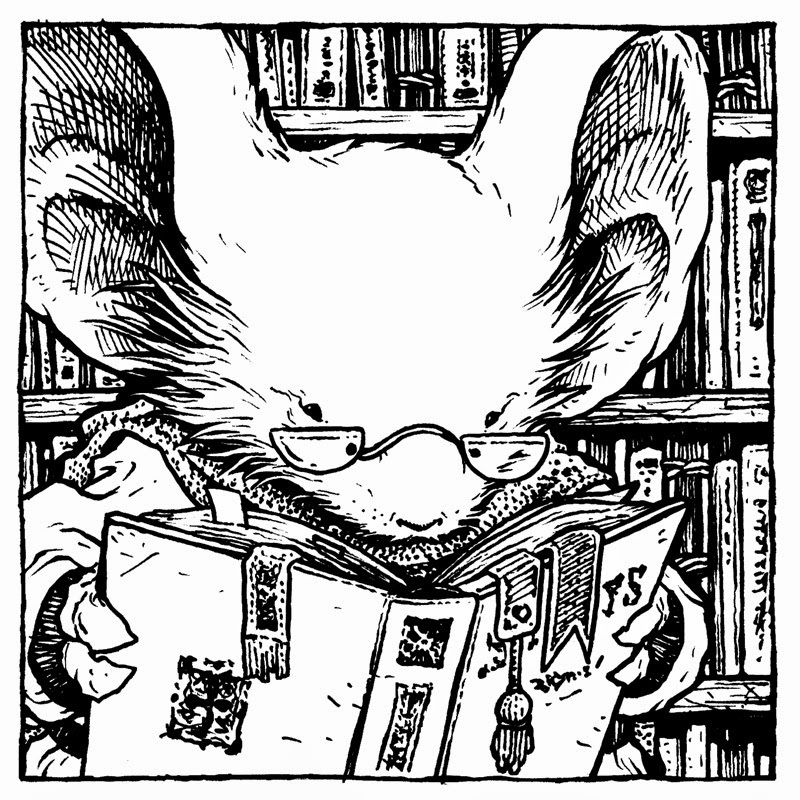 After scanning my inks back into Photoshop, I came up with this monochromatic mockup for Archaia to look at. The idea was that the pattern was to be printed white and debossed while the linework was going to perhaps be branded or heat pressed on. 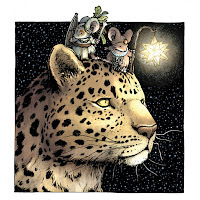 However for both technical and artistic reasons this idea was scrapped. 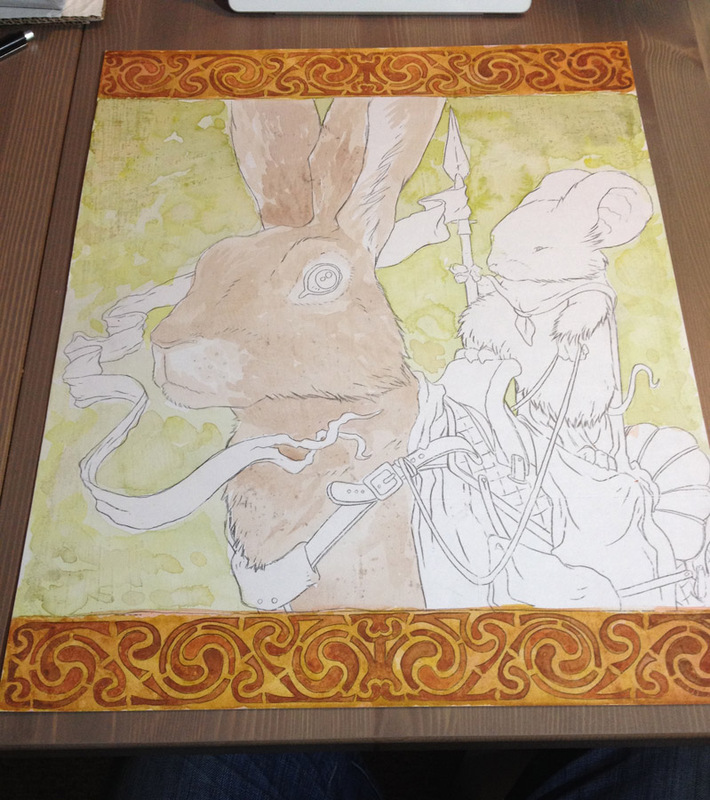 Another go-around had the cover being white with the mouse linework printed in black and the pattern not printed at all but only used as a template for a spot varnish (which would make it only visible when light hit it just-so). The cover version we ended up going with was closer to my original tan one, but now with the mice having a muted and barely rendered color scheme. 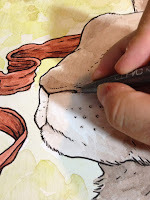 The pattern will be printed slightly darker than the cover color, but will also be coated with a spot varnish to make the pattern sheen in the correct light. 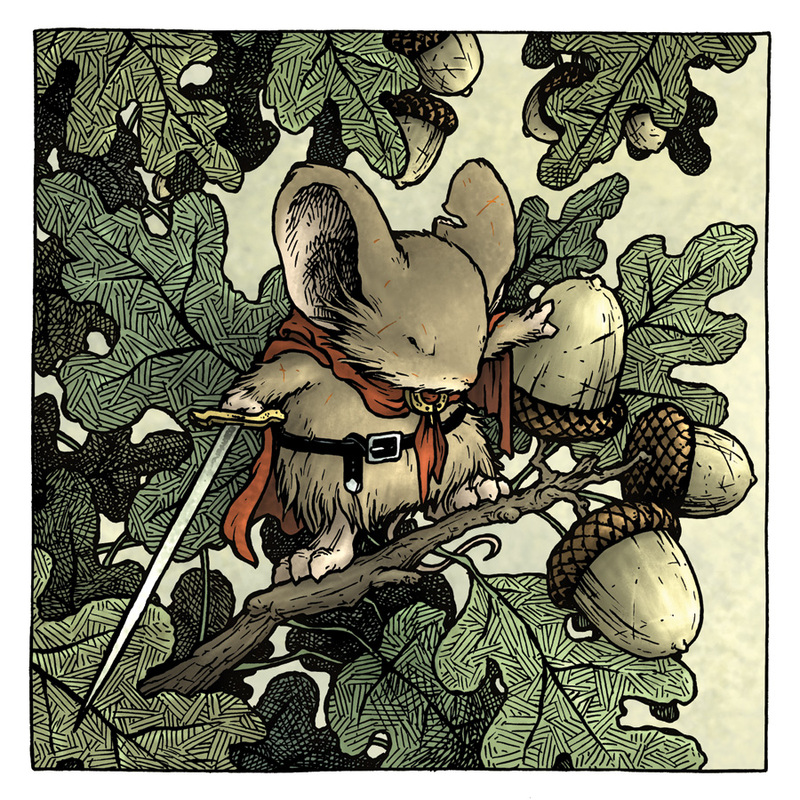 The Art of Mouse Guard 2005-2015 will be available at Your Local Comic Shops, Amazon, Barnes & Noble, and conventions either I or Archaia/BOOM! attend this year.